The 5 Reasons Why You NEED to Attend San Diego Burger Week. Feeling hungry? 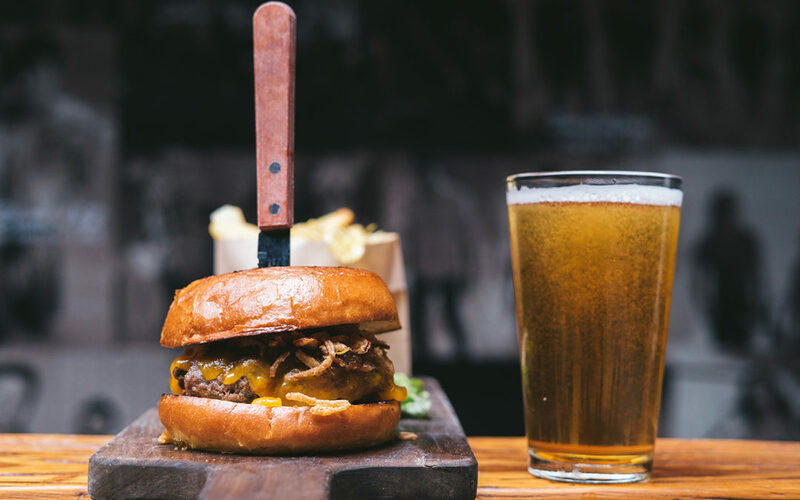 CityBeat is hosting San Diego’s annual Burger Week this May 4-12, 2018 at over 50 San Diego restaurants! Whether you’re a burger fanatic, or you just enjoy a hearty meal, you can celebrate America’s sweetheart: the Burger all week long! 1. The best deals all year. Participating restaurants will prepare their unique take on the classic burger for only $6. Say what? That’s right! You can chow down on some grilled goodness for a price that won’t break the bank. At $6, you can feel free to celebrate all week and try out burgers at different participating restaurants! 2. You get to explore San Diego. Restaurants all over the San Diego County will be participating in Burger Week! This will give you an excuse to explore the parts of San Diego you haven’t gotten around to yet. From Pacific Beach to the Gaslamp Quarter, and so many other locations… you may just find your new favorite spot! 3. You can splurge on juicy burgers, even if you don’t eat meat. Various restaurants participating in this year’s Burger Week are also offering Plant-Based, Vegan and Vegetarian options! 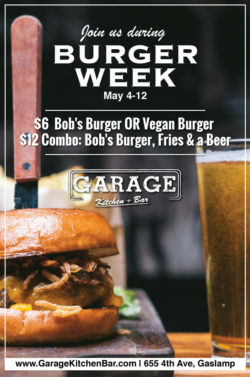 Here at Garage Kitchen + Bar you can try a juicy, “beyond” meatless patty in our Vegan-friendly burger! 4. You can win money. You have the chance to win the CityBeat Burger Week Grand Prize of $300 (in gift certificates at participating restaurants). All you have to do is Snap, Share and Win! Take a picture or selfie while celebrating Burger Week, upload your photo to Instagram using #citybeatburgerweek and check in at the restaurant (use #sdcitybeat too for extra points). Share as much as you can during the week (10 check-ins minimum to qualify). You should also hashtag for the restaurant as well. When you visit Garage Kitchen + Bar, make sure to tag us and #garagekitchenbar. 5. It’s the perfect tailgate or post-game meal! The San Diego Padres have home games EVERY DAY of Burger Week. That means 8 full days of Beer, Burgers, and Baseball. What is more American than that? The best place to spend time with friends before or after the game is in the heart of San Diego’s famous Gaslamp Quarter: walking distance from Petco Park! Grass-fed Angus beef, caramelized onions, white cheddar & house sauce. “Beyond” meatless patty, LTO, pickles, veganaise, harissa ketchup on a potato bun. Can’t wait until Friday for CityBeat’s Annual Burger Week? Kick it off on Monday at Garage Kitchen + Bar. …or join us for 51% off Happy Hour 4-7pm every day!